When traveling, it’s always a good idea to take special security precautions—regardless of your method of transportation or your destination. When traveling by plane, taking measures to secure your belongings is especially important. This is why many travelers choose to place locks on their baggage. At the same time, you generally don’t want to use just any luggage lock to secure a bag. If you plan on checking any of your luggage, it will be in your best interest to use a TSA-approved luggage lock. Specifically, a TSA-approved luggage lock refers to one that meets the requirements of the Transportation Safety Administration. A TSA-approved lock can be opened by authorized agents when the need to check your baggage arises. This is done through the use of a universal key that all TSA agents have access to. From there, the lock can be re-locked when the inspection is completed. What Do These Locks Look Like? All TSA-approved locks will have the unique “Travel Sentry” logo; these are the only locks that have been officially approved by the TSA and that will work with the universal key that TSA agents have access to. The Travel Sentry logo can be seen below on an example of what most TSA-approved locks look like. Most TSA-approved locks will have both a keyhole and a combination. Travelers can select their own unique three- or four-number combination or use the key that comes with the lock, but TSA agents will use their universal key to open the lock. Some TSA-approved locks do not have a combination but only work with a key. 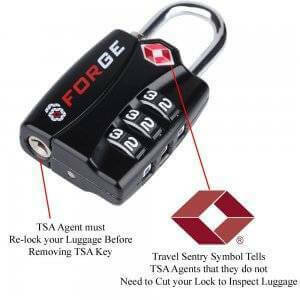 Why Use A TSA-Accepted Luggage Lock? There are many reasons to use a TSA-approved luggage lock on your baggage when flying. For starters, these locks provide the added security you desire when traveling with valuables, such as electronics or jewelry. While it is generally recommended that you bring valuables on your carry-on so they can stay on your person at all times, this is not always possible. In these instances, having a TSA-approved lock on your luggage can give you additional peace of mind when you need to check your bags. Furthermore, because these TSA-approved locks can be opened and re-locked by any TSA agent, you don’t have to worry about your locks being cut off if a TSA agent needs to inspect your luggage. Instead, he or she can simply use the universal key to access the contents of your luggage and then re-lock it before sending it on its way. TSA-approved locks are by no means a requirement. You are welcome to use any type of lock you’d like on your luggage, but you should be aware that if you use a non-approved TSA lock and your luggage needs to be inspected for any reason, the lock will be cut off. With this in mind, it is a good idea to use a TSA-approved lock if you want to lock your luggage for any reason—but again, it is not a requirement. If you need help setting up your lock, check out our TSA lock instructions. Does A TSA-Approved Lock Come With a Key? Generally, any TSA-approved lock that you purchase should come with at least one key to open the lock. However, this is not always the case and in some instances, you may need to purchase the key separately. When shopping for a TSA-approved lock, always check to find out if it comes with a key. If it doesn’t or if you need to pay extra for a key, you may want to choose another lock or opt for one with the option to use a combination code instead. Some travelers may actually prefer a combination to a key, since keys may be easily lost. How Does The TSA Open These Locks? All TSA-approved locks are designed to be easily opened using a universal key that is accessible by all TSA agents in the United States. Specifically, these locks have a special keyhole at the bottom for these keys. They can also be re-locked using the same key. Where Can I Buy A TSA-Approved Lock? These days, you can find TSA-approved locks just about anywhere travel gear is sold. If you need a lock at the last-minute, you can probably even find them at your airport. Often times, these locks come in packs of multiples, so you can pick up locks for all of your bags at once. What Should I Look For In A TSA-Approved Lock? When you’re shopping for a TSA-approved lock for your own luggage, there are a few things to be on the lookout for. Perhaps the most important thing to look for is the unique “Travel Sentry” logo; if the lock doesn’t have this logo or designation, it is not a TSA-approved lock and therefore will not be accessible with a universal key. You’ll also want to consider the type of lock that best suits your needs. Many TSA-approved lock designs can be opened with a key or combination. If you like the idea of being able to use a combination to open your lock, you’ll want to shop TSA-approved locks with three- or four-digit combination options. These are great if you have a tendency to lose keys or if you don’t want to worry about the hassle of bringing your key with you when you travel. Another consideration to keep in mind as you shop for TSA-approved locks in the size of the lock itself. Depending on your luggage configuration and design, you’ll want to make sure that the lock you choose will fit on your luggage and secure it properly. These locks come in a wide range of sizes and designs, so be sure to take any necessary measurements before you buy to ensure a proper fit. You might also want to take the color of your lock into consideration as you shop. TSA-approved locks come in a variety of colors, and many travelers will choose a specific color to help set their bag apart from similar bags on the luggage carousel. For example, if you have a common-looking suitcase (such as a plain black roller bag) and you want to reduce the chances that it will be mistaken for somebody else’s similar suitcase on the baggage carousel, opting for a bright-colored or other unique TSA-approved locks can be helpful here. When shopping for a TSA-approved lock without a combination option, you’ll also want to make sure that the lock will come with at least one key. Ideally, you’ll want to find a lock that comes with a back-up key in case you lose the original. Typically, these keys tend to be small and are therefore pretty easy to misplace. Another feature that you may want to look for on a TSA-approved lock is the built-in Search Alert indicator. These indicators can let you know if your bag has been searched by a TSA agent. These indicators usually come in the form of a red “dot” that will pop up when the lock itself is opened by a universal key. This is a nice feature to have, though it is also worth noting that the TSA will place a paper notification inside your bag to let you know if it was searched, so it’s not entirely necessary. What If I Forget The Combination On My TSA-Approved Lock? Many travelers enjoy the option of being able to open a TSA-approved lock using a three- or four-digit combination. If you decide to use a combination for your lock, however, it is important that you write it down and keep it in a safe place so you don’t forget it. Unfortunately, if you do forget the combination to your lock, there is no way to reset it and you will need to purchase a new lock. You may also need to cut off your existing lock if you cannot remember the combination to get it open. Fortunately, if you have purchased a TSA-approved lock that has both a combination and key option, you can always use your set of keys to get your lock open. Just remember that you will need to use the key from this point on, so you won’t want to misplace it. TSA-approved locks are relatively inexpensive, so if you are committed to using a combination but you forget the combination on your existing lock, it’s not a big deal to simply cut off the existing lock and replace it with a new one. Consider writing down your combination to keep in a safe place or storing it in your phone so you don’t forget it again. Overall, having a set of TSA-approved locks for your luggage is a great way to enjoy added security and peace of mind while traveling. Just be sure to always purchase TSA-approved locks with the red “Travel Sentry” logo on them to ensure compatibility with the TSA’s universal keys. From there, you can travel with greater confidence, especially when you have valuables or sensitive information in any of your checked bags.